*Prices do not include on-road costs. 4x4 dual-cab pick-up automatics only. Its VM Motori engine is designed in Italy, the six-speed auto in the USA, the chassis and body in Brazil, with Australian engineers involved in bringing the whole thing together. Not once, but twice, as what we have here is the Colorado reborn. In what was a global General Motors effort, the all-new Colorado arrived in 2012. (Confusingly the Colorado name was also attached to the last of the Isuzu utes sold as Holdens, replacing the long-running Rodeo nameplate.) The Colorado was then tweaked in 2013 and again in 2014 before being pulled right apart and put back together again with literally a truck load of new and revised parts for the 2017 model, launched late 2016. While most of the changes applied to the Colorado globally, Australian models received additional NVH, auto gearbox and manual gearing upgrades at the behest of the local engineering team. Displacing 2.8-litres, the Colorado’s engine – along with that of the Hilux – is one of two "small" engines here but claims maximum torque of 500Nm, a figure only bettered in this company by the Amarok’s V6, although it revs harder than the others engines to deliver its best. Most telling is the comparison to the big "lazy" five in the Ranger. Where the Ranger’s max torque of 470Nm is on tap by 1500rpm, the Colorado’s 500Nm doesn’t arrive until 2000rpm. And while both engines claim 147kW, the Colorado needs 3600rpm to achieve that figure, 600rpm more than the Ranger. The good news is the Colorado actually delivers on its promise and pedal-to-the-metal will comfortably better the Hilux and even nose out the Ranger, although it is a bit lighter than the Ranger which no doubt helps. 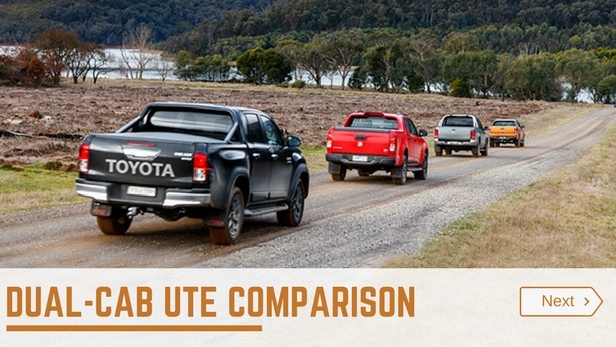 Aside from needing more revs on board and feeling a little "busy" in this company, the Colorado’s engine also can’t match the refinement of the Amarok’s V6 or indeed the Hilux’s four, although the MY17 upgrades now see it comparable to the Ranger’s engine in terms of noise control. The Colorado’s cause is aided by what is the most proactive and sporty gearbox of the three six-speeders. Most noticeable is the way it will downshift on descents to provide additional engine braking, even at times without the driver needing to apply the brakes to active a downshift. 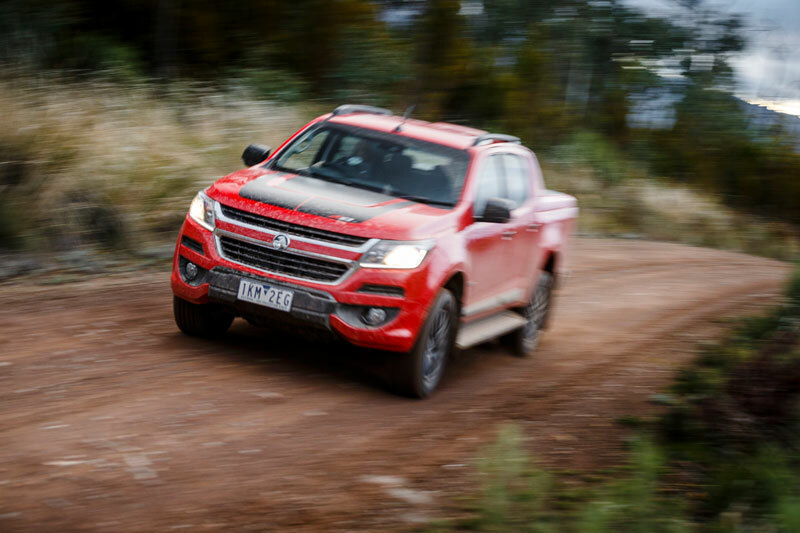 The Colorado’s 2017-model makeover included the adoption of electric power steering (EPS), although Holden insists it started down this track before Ford announced that the Ranger would switch to EPS for the 2016 model. Along with EPS, the 2017 Colorado’s suspension was retuned, most notably at the front where the springs, swaybar and dampers were all changed. The end result is a ute with light and easy steering, good manoeuvrability at parking speeds and a confident and composed feel at highway speeds. Nice ride quality for a ute too on most roads – even unladen – and the front-to-rear suspension balance is nicely sorted. The only complaint is that on rougher gravel and dirt roads with big potholes and the like, the Colorado’s front end isn’t quite as compliant or as absorbent as the other three. The fact that the Colorado’s suspension feels the big potholes and washouts on gravel roads more than the other three gives a hint to its off-road ability, or more its off-road limitations. In this company the Colorado has the least suspension travel – something that’s also evident with its platform-twin in the Isuzu D-Max – and when the going gets particularly gnarly, the Colorado is the first to struggle. And when it does there’s no rear locker to come to its aid, the only vehicle in this four not thus equipped. 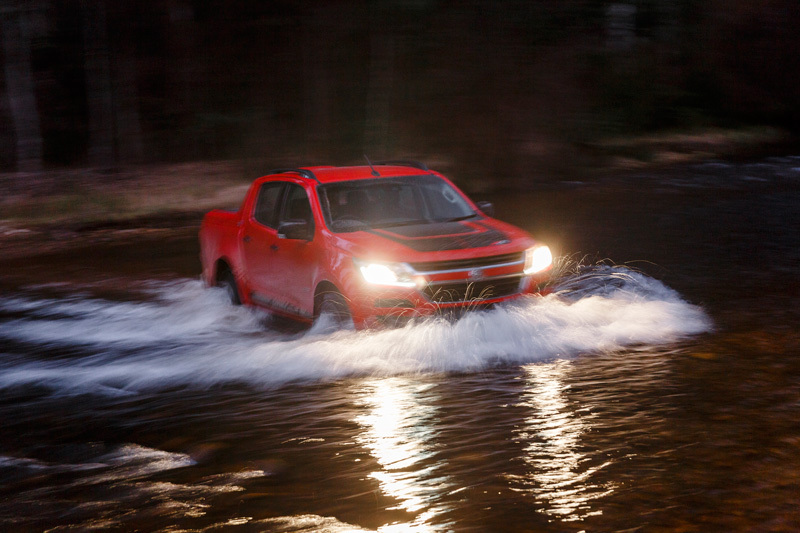 All that’s not to say the Colorado isn’t a handy recreational 4x4. There’s still decent ground clearance, tidy approach and departure angles, good vision from the driver’s seat and a gearbox with clever off-road shift protocols. With all-terrain rather than the standard highway tyres it would be better again. The Z71 looks like an upmarket ute from the outside and that impression is carried over to the cabin with its heated and leather seats. Like the Ranger Wildtrak there’s no reach adjustment for the steering wheel (only tilt) and like both the Ranger and Amarok, no smart-key entry or pushbutton start to match the TRD. 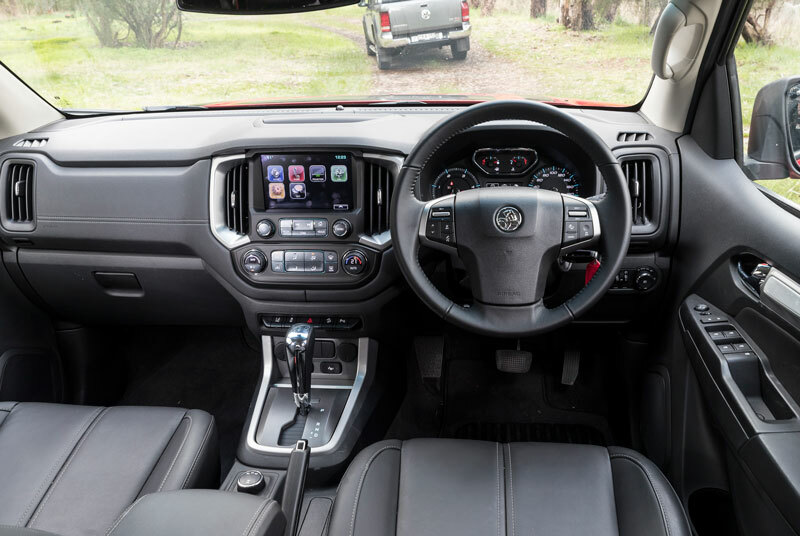 Regardless, the Colorado is roomy and comfortable up front, while the rear seat is roomier than that of the Hilux although not as wide as the Amarok, nor does it have the combined front and rear legroom of the Ranger. Seven airbags help contribute to five-star safety and, as standard, the Z71 has lane-departure warning and forward collision alert. No standard towbar for the Z71 but the soft tonneau is part of the package, as is the rear "aero kit" that looks good but affects access to the tub’s front tie-down hooks. 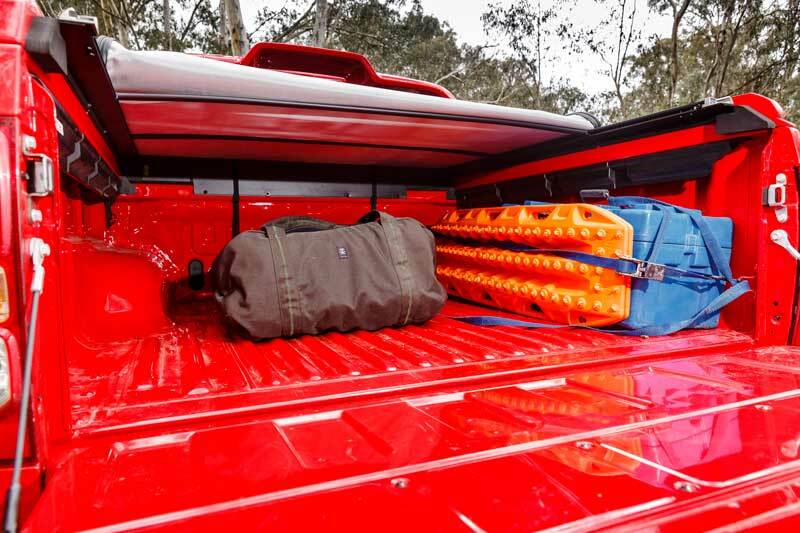 The Z71, like all Colorado dual-cab 4x4s, is rated to carry just over a tonne and tow 3500kg. From our max load and tow test we know the Colorado does both with reasonable ease. The Z71 runs on 265/60R18s and if the 18-inch wheels aren’t to your liking you can fit the 17s from the LT, which will open up your choice of all-terrain rubber although, increasingly, there’s more AT options for 18s. The Z71 is based on the volume-selling LTZ but adds leather, heated front seats, roof rails and a tub-mounted body kit. Like the LTZ it also has 18s, sat-nav, auto wipers, front parking sensors, tyre-pressure sensors, electric-adjust for the driver’s seat, a soft tonneau, a sports bar, lane-departure warning and forward collision alert. This builds on the standard equipment of all Colorado 4x4 dual-cab pick-ups, which includes seven cabin airbags, a reversing camera, cruise control, rear parking sensors, a digital radio, Apple CarPlay, Android Auto and trailer-sway control. *Based on test fuel use, claimed fuel capacity and a 50km "safety" margin.